Biocontrol agents are the natural organisms like parasitism, predation and other mechanisms for controlling the plant pests. They play a key role in controlling the plant pests such as nematodes, weeds, mites. These biocontrol agents helps in maintaining and balancing the plant species like nematodes weeds, insects and mites. Biocontrol agents have no side effects as they are eco- friendly in nature. Due to the lucrative aspects, Biocontrol agents are replacing the pesticides and other chemicals. Factors such as ease of use and its availability are driving the biocontrol agents market. Biocontrol agents are effective throughout the season and are considered economical as compered to other chemicals such as pesticides and insecticides, thus the growth of biocontrol agents will certainly expand in the coming future. Increasing investments by key market players in biological solutions especially in R&D capabilities is creating opportunities for the biocontrol agents market. However, lack of awareness and knowledge among growers regarding biocontrol agents are hindering the growth of market. This report incorporates an in-depth assessment of biocontrol agents market by active substance, application, environment, crop type, target pest and geography. The major types of biocontrol agents encompassed in the scope includes various active substances such as microbials and macrobials. What are the major applications for Biocontrol Agents? The various applications include on-field, seed treatment, post-harvest. Among these applications of biocontrol agents, on-field application is growing at a faster rate. On-field sprays protect the field’s crop, vegetables and food products that are cultivated from various pests and insects that may damage the production. On-field spraying is considered safe to use and thus most of the farmers are using this technique for better production. 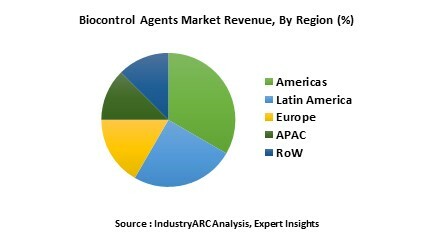 Who are the Major Players in Biocontrol Agents market? The report incorporates in-depth assessment of the competitive landscape, product market sizing, product benchmarking, market trends, product developments, financial analysis, strategic analysis and so on to gauge the impact forces and potential opportunities of the market. Apart from this the report also includes a study of major developments in the market such as product launches, agreements, acquisitions, collaborations, mergers and so on to comprehend the prevailing market dynamics at present and its impact during the forecast period2018-2023. All our reports are customizable to your company needs to a certain extent, we do provide 20 free consulting hours along with purchase of each report, this will allow you to request any additional data to customize the report to your needs. Evaluate market potential through analyzing growth rates (CAGR %), Volume (Units) and Value ($M) data given at country level – for active substamce, applications and by different crops. Get a quick outlook on the market entropy – M&As, deals, partnerships, product launches of all key players for the past 4 years.